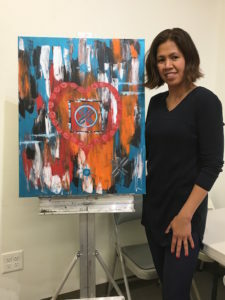 One week ago, Mylene P. attended my Personal Power Painting class and created this awesome painting! I am so deeply humbled and overjoyed to share her testimonial about the class. What she got out of it was exactly what I was going for in creating the class, and she stated it so eloquently. Thank you Mylene!